The 4025 gets 4WD, and the 4010 comes with a manual gear box or a hydrostatic drive for 2012. On the heels of the new Mahindra Max "mid-compact tractor" launch, Mahindra USA dealt out another triple with the launch of the 4WD 4025, and the 4010 in hydrostatic or manual gear box trim. The new 4025 4WD adds extra traction to Mahindra's best selling model and makes it a candidate for material handling, lifting hay bales, rotary cutting and digging chores. 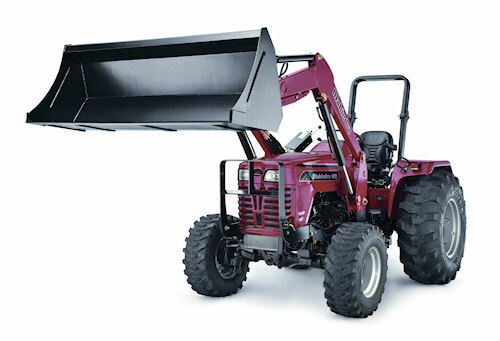 The 4025 is powered with a four-cylinder Mahindra-built diesel engine and comes with the best loader lift capacity in its class along with skid steer quick bucket attach. Mahindra's popular 4025 tractor is now offered in 4WD trim, along with a pair of new 4010s, for 2012. Also, the 4025 4WD has a three-point hitch with draft control standard, and an easy-on-easy off platform with a long-lasting transmission and brakes. It is available with a factory- or dealer-installed backhoe. The 4010 models, either a geared version or an HST version, are powered with a Daedong engine and feature easy push button Power Take Off. The HST model comes with a mid PTO standard. Also, the 4010s have a four link loader tilt with Skid Steer quick attach features, and require no tools for loader removal. And, like the 4025 models, one can have the 4010 with a backhoe installed at the factory or at the dealership. All Mahindras come with a 5-year powertrain warranty, and will be available in dealerships in March, 2012.